Kindergarten is a program for young children delivered by a qualified Early Childhood Teacher, usually in the year before school. Please note that children cannot attend more than one year of funded kindergarten. For a child to access a second year of funded kindergarten they need to meet the criteria set by Department of Education and Training (DET). Kindergarten places managed through the Central Enrolment Service are for sessional and long day care kindergarten programs. If sessional kindergarten hours don’t meet the needs of your family a funded kindergarten program in a Long Day Care centre may better meet your needs. Day Care Rates may apply for Kindergarten in a Long Day Care setting. is My Child Eligible For Kindergarten This Year? Children who turn 4 years old on or before the 30 April in the year they will be attending kindergarten. Children who have received funding for a second year of 4 year old kindergarten. Children who were eligible to attend the kindergarten program in the previous year but parents chose to defer to the following year. Children who are turning 6 years of age in their year of kindergarten who have been granted an exemption from school entry age requirements by their regional Department of Education and Training (DET) office. Please note children do not need to be toilet trained to attend kindergarten; however independent toileting skills are encouraged. The person(s) who has lawful authority for a child (parent(s), legal guardian(s) or guardian(s)) can enrol a child at a children’s service, complete the enrolment form and sign the relevant authorisations pursuant to regulation 160 (3) (c) and (d) for Approved Children’s Services. If there are any court orders in place relating to the powers, duties, responsibilities or authorities of any person(s) in relation to the child or access to the child, the Nominated Supervisor or the Responsible Person in Charge must ensure the details of the court order are recorded in the child’s enrolment record pursuant to regulation 160(c) and (d) for licensed children’s services. The Educators should be familiar with any court orders and abide by them as they relate to the provision of care and education of the child at the service. To be eligible to attend a funded kindergarten program in the year before school, children must be at least four years old by 30 April in their kindergarten year. Each child develops at their own rate and, although your child’s age may make them eligible to start kindergarten, other factors may impact on their readiness for such an experience. To access Early Start Kindergarten, eligible children must be at least three years old by 30 April in the year they attend. To discuss your child’s kindergarten readiness you can talk to your maternal and child health nurse or your local kindergarten teacher. Children cannot commence in a kindergarten program until they have had their 3rd birthday. Do educators interact positively with children, other educators and parents? Do educators make you and your child feel welcome? Are the children well supervised at all times in a way that suits their age and development? Is the educational program run inside and outdoors? Are there spaces for children to be involved in active, noisy play as well as space for quiet play? Is the service clean and well maintained? Does the equipment support the children’s educational program? Is there enough equipment for the children? Is important information about the service and its educational programs displayed? Attending a kindergarten program is an important step for your child. It will help your child learn skills they will build on throughout life, strengthening their enthusiasm for learning. At kindergarten, your child will grow socially and emotionally. Their ability to think, use and recognise language and to use their fine motor skills will be developed through play, art, dance, music, movement and interaction with others. Fine motor skills include the ability to handle and pick up small objects, transfer objects from hand to hand, and various hand-eye coordination tasks, such as cutting, drawing, writing or threading beads. Attending kindergarten also provides families and carers with the opportunity to get to know other families. Through links to other local early childhood services kindergarten educators can help families to access a range of early years support services. The Victorian Government provides funding to make kindergarten fees affordable so that all children have the opportunity to participate in a kindergarten program in the year before school. This is usually when they are four years old. Kindergarten services charge fees to contribute to the cost of operating the kindergarten program. In some cases, a child attending a kindergarten program may be assessed by the teacher to be eligible for a further year of a funded kindergarten program before they go on to school. The teacher will discuss this assessment with you and this will assist you to make a decision about a further year. When this occurs, the child may turn six years of age (compulsory school age) while attending the second year of funded kindergarten and therefore must be exempted from attending school by the Department of Education and Training. Parents and guardians are responsible for seeking this exemption, however your child’s teacher can assist you with this. The Victorian Government kindergarten fee subsidy provides eligible families with access to 15 hours a week of kindergarten per week at no cost. Triplets or quadruplets attending kindergarten in the same year. The service applies on your behalf to the Department of Education and Training (DET) for the kindergarten fee subsidy, and can do so at any time of the year. The Department of Education and Training is responsible for regulating Education and Care Services and Children’s Services. All education and care services and children’s services in Victoria are required to ensure that children are educated and cared for in an environment that is safe, meets their learning and development needs, and supports their health and wellbeing. The Victorian Early Years Learning and Development Framework describes the Principles, Practices and Outcomes essential to advance young children’s learning from birth to eight years of age. Each learning outcome is targeted to develop the knowledge and skills children need to be confident and happy throughout their life. Kindergarten Inclusion Support Packages provide support that enables children with high support needs and diagnosed disabilities to take part in funded kindergarten programs. The services aim to develop a sense of belonging and inclusion for all families and to respond to children and families’ individual needs. The Preschool Field Officer Program supports the access and participation of children with developmental concerns and additional needs in kindergarten programs, who are usually not receiving support from Early Childhood Intervention Services or Kindergarten Inclusion Support Service Packages. The program is run by Preschool Field Officers, who are highly qualified Early Childhood Professionals specialising in early childhood education and development. They support those services offering funded kindergarten programs by providing consultation, resources and advice to educators and families. Any family with a child attending a government-funded kindergarten program with additional needs or a teacher working in a government-funded kindergarten program can access this service. A referral can be made by a parent or teacher. Referral forms can be obtained from your local early childhood service. 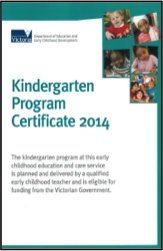 A kindergarten certificate displayed at a children’s service will show that the kindergarten program at the service receives Victorian Government funding and is delivered by a qualified early childhood teacher. Look for this certificate, at the entrance to the service, when choosing a kindergarten or child care program for your child. As a parent or guardian, the safety, wellbeing and development of your child is most important to you. Quality children’s services are those that provide valuable learning experiences with positive outcomes for children, while at the same time providing for the needs of their families. These services are well equipped to cater for the individual needs of children and improve outcomes for children. The service must display a Service Approval Certificate at the entrance to the service and include any conditions, waivers, or exemptions that may apply to it. The Kindergarten Certificate must be displayed if the service is providing a funded kindergarten program (please refer to page 7). Visiting a service is a good way to check for quality. It gives you the chance to see the service, observe the educators and children and to ask questions. Another quality check is to look on the ACECQA website and check what rating the service received for their National Quality Assessment rating, this is also displayed at the service www.acecqa.gov.au. How does the program meet the different needs, interests and experiences of all the children, and how will it be shared with me? How will my child’s learning be shared with me? If my child is accepted at the service, which room or group will they be in? How many children are in that room or group? How old are they? How many educators will work with them? Will the same educators consistently care for my child? Am I welcome to visit at any time of the day? What are the arrangements for providing food and drink for children? What are the sleeping/rest arrangements for children? What are the arrangements for administering medication? How will any of my concerns about my child’s care be addressed? Keep the teacher informed of changes in your child’s life that might affect your child’s experience at their service. Long day care is the term used for centre-based child care services. Long day care services provide care and education for children on an all-day or part-time basis. Programs are provided mainly for children aged between birth and six years, although some services provide care for limited numbers of primary school-age children before and after school and during school holidays. Long day care services employ qualified staff and many services offer a funded kindergarten program. Victorian Government funding contributes to the cost of a service providing 15 hours per week. Services usually charge parents a fee on a weekly, term or annual basis. You will need to contact the services directly to determine the cost of the kindergarten program you are interested in. Early Start Kindergarten provides eligible three year old children with access to kindergarten for up to 15 hours per week for free. It is available for three year old Aboriginal and Torres Strait Islander children and children known to Child Protection (including children referred from Child Protection to Child FIRST). Children must be aged at least three years by 30 April in the year they attend. A parent/carer, Child Protection, Family Services/ Child FIRST practitioner or Koori Engagement Support Officer need only advise about a child’s eligibility for Early Start Kindergarten. No supporting written documentation is required. From 1 January 2012, the National Quality Framework applies to kindergartens, long day care, family day care and outside school hours care services across Australia. These services are now required to operate under the Education and Care Services National Law Act 2010 and meet the new National Quality Standard. Education and care services will be assessed and rated, with a focus on seven key quality areas of the National Quality Standard. These ratings will help parents make more informed choices about the education and care of their child. The Victorian Government is committed to delivering an inclusive early childhood and school system that ensures that all families and their children have access to quality services and support to meet their needs – no matter what your family’s circumstances or background. This includes families whose children have diagnosed disabilities and developmental delays, and refugee and asylum-seeker families. The following programs respect your family’s individuality and help develop connections with the community that will encourage your child’s learning, development and wellbeing in the early years. The Early Years are critical for the long-term health and development of all children, including children with disabilities and developmental delays. If your child has had their third birthday and has not yet turned five, it is recommended that you have your child attend the Maternal Child Health Nurse for a 3 1/2 year old assessment (this assessment is not compulsory). At this consultation your toddler’s growth, health and development will be reviewed and your nurse will give you information about starting kindergarten. Your toddler will also be given a vision screening. Preferences Only nominate the kindergartens you are willing to accept. Children not placed at their first preference may be offered a position at another service. All kindergartens have a limited number of places available. Some kindergartens may have a high number of applications due to their location. If you indicate less than five preferred services, you limit placement options. Parent/Legal Guardian Name All correspondence will be sent to the Parent or Legal Guardian. Please provide a valid email address, as this is our preferred method of communication. Incomplete Applications No application will be processed without current Immunisation History Statements and application fee OR concession card details. Where a family has been offered a place and not responded through three separate allocations, the application will be withheld from further placement until the family contacts the Central Enrolment Officer. Concession Attach a photocopy of your current concession card. Please note that you will be required to supply a copy of your concession card to different departments eg Enrolments and Finance. Indigenous Additional funding can be provided to kindergartens to support children of Aboriginal or Torres Strait Islander culture. If your child is from one of these cultures, please tick the box. Additional Needs Children with developmental delays or disabilities can be supported in transition to kindergarten if information about their individual needs is provided. Additional funding may be available to support children with additional needs. Agreed Process All Services involved in the Central Enrolment System follow the same agreed placement rules and guidelines.